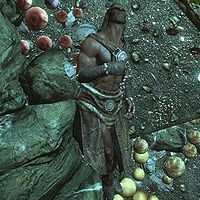 Agrius is a dead Imperial bandit found in the first part of Halldir's Cairn. His dead body is found along with those of his friends, Vidgrod and Raen, next to the magical cairn. According to his journal, he and his friends were in a bandit gang but were kicked out and took refuge in Halldir's Cairn. He was the last of them to be possessed by Halldir. He wears a randomly determined set of light armor; at all levels, there is always a 50% chance he will wear fur shoes and a set of fur armor, while the other 50% can differ; at level 1-5 it can be hide boots and/or hide armor, at level 6-18, it can be leather boots and/or leather armor, and at level 19-28 it can be scaled boots and/or scaled armor or scaled horn armor. Additionally, he has a 50% chance of wearing a set of leveled gauntlets, again randomly determined; it can always be fur bracers but, at level 1-5, there is a 50% chance it can be hide bracers, at level 6-18 it can be leather bracers and at level 19, it can be scaled bracers. Lastly, there is a 20% chance of him carrying a leveled shield, up to elven quality at level 12. His weapon of choice is random and leveled as well (up to elven quality at level 22) and can be either a mace, a sword or a war axe. He also carries a bit of random loot, food and drink, with a slim chance of a lockpick and/or some gold. Agrius' body, along with his two friends, is consumed by Halldir to make his three elemental copies during your fight with him. Unlike the bodies of Vidgrod and Raen, Agrius' body is not removed after Halldir consumes their souls to summon his elemental copies. ? This page was last modified on 26 October 2017, at 21:00.